Krishna Udayasankar, an Indian bestselling author, pens an enlightening and highly thrilling part fantasy and part mythology book, Immortal that revolves around a cynical history professor, who has been walking on the Earth since the beginning of the time and will be walking till the end of the time, and his quest to find a historical and supposed to be extinct as well as mythical object with the help of his patient assistant and a mysterious young and beautiful woman, traveling across the borders and the seas. Professor Bharadvaj is more than just another whisky-loving, gun-toting historian-for-hire. Behind the assumed identity of the cynical academic is a man who has walked the earth for scores of years. He is Asvatthama - the cursed immortal, the man who cannot die. When Professor Bharadvaj is approached by the enigmatic Maya Jervois to search for a historical artifact unlike any other, he is reluctant to pursue it. The object in question, the Vajra, is rumored to possess incredible alchemical powers, but the Professor does not believe it exists. After all, he has spent many lifetimes - and identities - searching for it, in a bid to unearth the secret to his unending life. Yet, as the evidence of its existence becomes increasingly compelling, the Professor is plunged into an adrenaline-fueled adventure that takes him from the labyrinthine passages beneath the Somnath temple to the legendary home of the siddhas in the Nilgiris, and finally into the deserts of Pakistan to solve a confounding puzzle left behind by the ancients. But who is behind the dangerous mercenaries trying to thwart his discoveries at every step? And is the Professor - a legendary warrior in a long-ago life – cursed to walk the path of death and bloodshed forever? Professor Bharadvaj, the cursed immortal, the talented historian, has been approached by a young and mysteriously charming lady, Maya Jervois, to find the missing pieces of an historical object that still holds powers of alchemy, called the Vajra, the most valuable weapon built by the alchemist, Nagarjuna. Although the said object was said to be lost from the face of the world and Professor Bharadvaj has been looking for it from the beginning of time, but with no luck. Moreover, Professor Bharadvaj has stopped believing in that object, hence reluctantly he accepts Maya's offer. Alongside his calm yet haughty assistant and the young lady, Professor Bharadvaj embarks on a quest to search for that artifact, but little did anyone knew that they would have to face near-death, hurdles and complicated challenges while jumping from one destination to another across the seas and the mountains. Honestly I've never before came across an Indian fantasy novel that is so excellent, intriguing and so much well written. 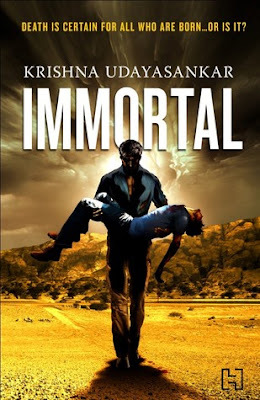 Even some of the top authors of this genre would be put to shame, as their books would fall short and meager in every respect when compared to Udayasankar's book. This book proved to be one hell of a wild and crazy roller coaster ride complete with adrenaline rushing actions, heart pounding moments and anticipating folds that only make the book arresting enough for any reader to keep them glued till the very last page. The author's writing style is flawless, coherent and is laced with so much emotions, actions and historical facts that I'm pretty sure, after reading this gem, any reader would feel highly interested and enlightened about the Indian, Greek and Egyptian mythologies. The narrative is articulate and easy to comprehend with. Moreover, the author pens the whole story in an engaging manner as she depicts each and every scene in this book with careful and thorough details that will vividly roll right in front of the eyes of the readers. The author projects so many historical and mythological stories through the dreams and the voices of the central character, that are not only accurate but are highly illuminating and thought-provoking. The pacing of the book is fast, even though the author unravels the many layers in this story one after another, only after building enough tension in the hearts of the readers. The mystery is not only mystifying but is highly adventurous, that is often bone-chillingly creepy and at times, extremely puzzling like a dark maze and it is surely going to keep the readers on their edges till the turn of the very last page of the book. The author also captures the backdrops of each destination from the temples in Gujarat to the mountains in the Tamil Nadu to the holy ghats in Varanasi to the golden sandy deserts in Pakistan to the dusty and dingy alleyways in Delhi, vividly and hence the readers are bound to shift from one destination to another, alongside the characters. The characters are well crafted out highlighting enough realism in their demeanor, flaws, talents and strength thereby making them look honest and authentic in the eyes of the readers. Even though the central character is fantastical yet the author portrays the professor as someone relatable. His backstory is strikingly enough for the readers to support this mystifying immortal man till the end of his journey. Apart from being brave, strong, emotional, passionate, brooding, super talented and super natural with a brain like Einstein, the professor is down-to-earth. His enticing voice all through out the story will simply compel the readers to keep turning the pages of this book frantically till the very end. His chemistry with Maya is compassionate and desiring enough for the readers to keep rooting for the odd couple. The supporting cast of characters are also well developed and impressionable. In a nutshell, this adventure is not to be missed by the Indian readers, as they will not only get to explore the forgotten parts of mythology, but will also get mesmerized into a thrilling journey to find a lost mythical weapon. Verdict: A profound tale of history, mythology laced with fantasy that is a complete page turner. Krishna Udayasankar is the author of the Aryavarta Chronicles (Govinda, Kaurava and Kurukshetra) and 3 – a novel based on the founding myth of Singapore. She is also the author of Objects of Affection, a full-length collection of prose-poems and a co-editor of Body Boundaries: the Etiquette Anthology of Women’s Writing. Her short fiction and poetry also feature in many print and online anthologies. Krishna holds an undergraduate degree in law and a PhD in strategic management. She lives in Singapore with her family, which includes three bookish canine children, Boozo, Zana and Maya, who are sometimes to be found at her laptop, trying to make her writing better.